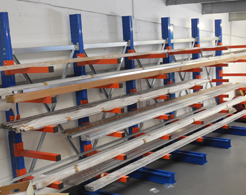 This weekend we installed our newest bank of heavy duty racking which has effectively quadrupled our stockholding capacity for the five metre and six metre tracks of sliding door gear. The result is our increased ability to supply ex-stock the widest range of sizes and specifications of sliding door kits and components for the widest range of door types. This entry was posted in sliding door gear and tagged components, five metre, kits, six metre, sliding door gear, tracks. Bookmark the permalink.